Recently in Vung Tau City, a ceremony took place for acceptance and handover of 26” gas export system among the South East Gas Project Management Unit (under PVGas) – the Investor; Bien Dong Petroleum Operating Company (BIENDONG POC) - investment entrusted unit; PTSC Mechanical & Construction JSC (PTSC MC) - the main contractor and the South East Gas Transportation Company (under PVGas) - asset management unit. The 26” gas export system includes: shuttle launch equipment and riser being placed on the wellhead platform of Hai Thach field under Bien Dong 1 Project to connect to Nam Con Son 2 pipeline Project through 3.5 km of 26” pipeline. The 26” gas export system of nearly 30 million US dollars is a part of Nam Con Son 2 project invested by PVGas, entrusted to BIENDONG POC for entire management of design, procurement, construction, fabrication, installation and pre-commissioning and performed by PTSC MC - the main contractor. The construction of this project aims to assure technical uniformity of the 26” gas export system to the gas production and transportation system of Hai Thach field as well as assurance of quality and implementation schedule along with Bien Dong 1 project. Although the scale of the project is not large, there are technical difficulties, especially the legal bases related to acceptance works. However, with the continuous efforts of the concerned parties and close guidance of PetroVietnam, the 26” gas export system Project has been completed on schedule, within the approved budget and granted certificate for completion by international registration authority. 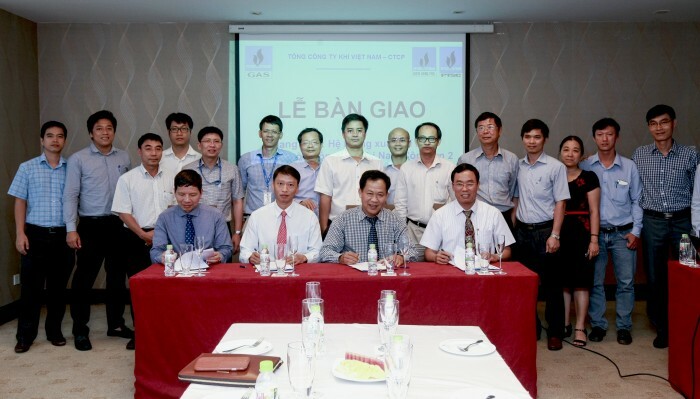 The successful implementation of the 26” gas export system project again acknowledges the remarkable steps of Vietnamese management staff and laborers on the way to gradually master the advanced technology in the spirit of "being innovative, dare to think, dare to do and dare to take responsibility" in the projects of the oil and gas industry. When the system is connected to Nam Con Son 2 pipeline, it will contribute to improve the operational efficiency of both projects BIENDONG 1 and Nam Con Son 2, bring socio-economic benefit for the South East region and help ensure national energy security.